Izmir – Last weekend (26-27/08), 11 teams of young migrant, refugee and Turkish entrepreneurs presented their innovative business ideas to IOM, the UN Migration Agency, in the hope of securing a grant. Under its entrepreneurship training and grants project, IOM is working to build business skills among young people, helping make their business ideas a reality. From 14–26 August, 11 teams comprising 23 participants worked with mentors and trainers as part of the InnoCampus Entrepreneurship Accelerator Training implemented by Innomate, a collaborative non-profit project partner of IOM. The two-week intensive course taught participants business management, finance and marketing strategies, as well as product design, prototyping and branding. Some of the businesses are social enterprises that aim to provide alternative solutions to problems, such as the “Mental Segment” project. Two young entrepreneurs have developed educational toys to help autistic children learn language and interact with their surroundings. This is the second phase of IOM’s entrepreneurship project in Turkey. The first was held in Gaziantep from February to May 2017, where three teams with the most viable business plans were selected to receive grants. These included Joon (modernizing traditional handicrafts created by refugees), Corners (a Syrian interior design team) and Akram (a business designing customized oriental watches). With the assistance of IOM’s entrepreneurship programme partnered with Innomate, Joon was part of a four-month training programme to help them develop their business plan. 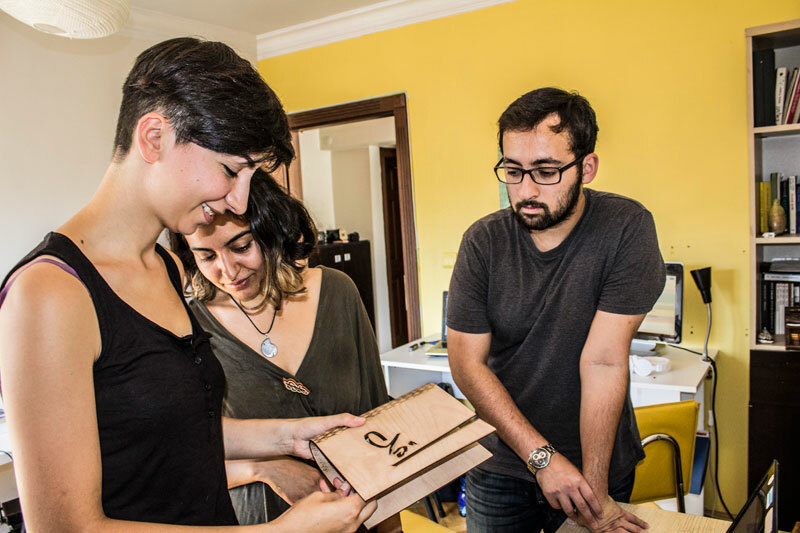 Duygu, Azra and Yashar from Joon have been developing their business plan to help talented refugee artisans bring their handicrafts to the commercial market. They have an innovative approach to handicrafts using laser design, 3D printing and other technologies to adapt traditional handicrafts to modern design. “It might be common for NGOs and small business to work with traditional craftsmen. However, the training programme helped us find our niche and to stand out from our competitors. Our business plan will not easily be overtaken by mass production,” said Azra. “We want to help the disadvantaged and to enable them to bring their passion to the market place. That is our passion,” said Duygu. Following the end of the programme in Izmir, the entrepreneurship training and grant project will move to Sanliurfa towards the end of the year (October 2017–January 2018) followed by Hatay in early 2018 (February–May 2018). Entrepreneurship teams that have an innovative business idea and are interested in taking part can contact info@innocampus.org for more information. IOM’s livelihoods programmes are funded by the US Department of State Bureau of Population, Refugees and Migration (PRM).